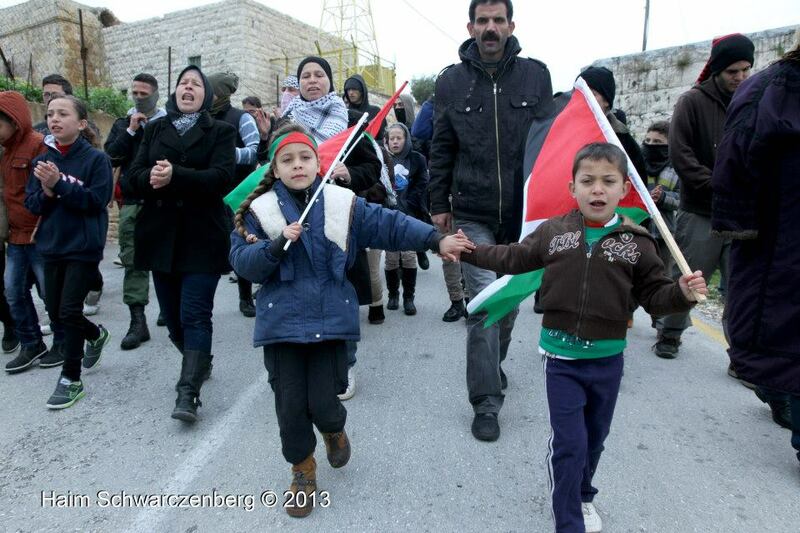 During the weekly demonstration in the village of Nabi Saleh, yesterday, Friday, dedicated to support the Palestinian prisoners in Israeli jails, some of the villagers of Nabi Saleh, along with other activists managed to get to the entrance of village’s spring “Alqaws” which was taken over by the settlers three years ago. Soldiers forcibly prevented them to approach the spring at the same time settlers were swimming in. Soldiers detained three Palestinian women, one Israeli activist and one American journalist. Among the detainees was Nariman Tamimi (36), a resident of the village and a Popular Resistance activist. Her Daughter, A’hd Tamimi (11) and two nephews, Marah (11) and Wiaam (11), were attacked brutally by soldiers preventing them from reaching the spring, and separating them from Nariman during her detention. [CORRECTION to PSCC report – Marah is the neice of Nariman]. After the arrests, the army raided the village, sprayed “skunk” water and threw stun grenades and tear gas at houses, and used live ammunition through the clashes with the residents. During the raids on the houses, several residents were injured, including: Azmi Tamimi (70), injured in his finger from a rubber bullet shot from point blank range, Martyr Mustafa Tamimi’s grandmother (90), injured in her leg from two rubber bullets, as she sat at her house door, Halla Tamimi (48), injured from a stun grenade thrown into her house and Ahmed Shaker (11), injured in his chin from rubber-coated steel bullet, in addition to several injuries from rubber-coated steel bullets. 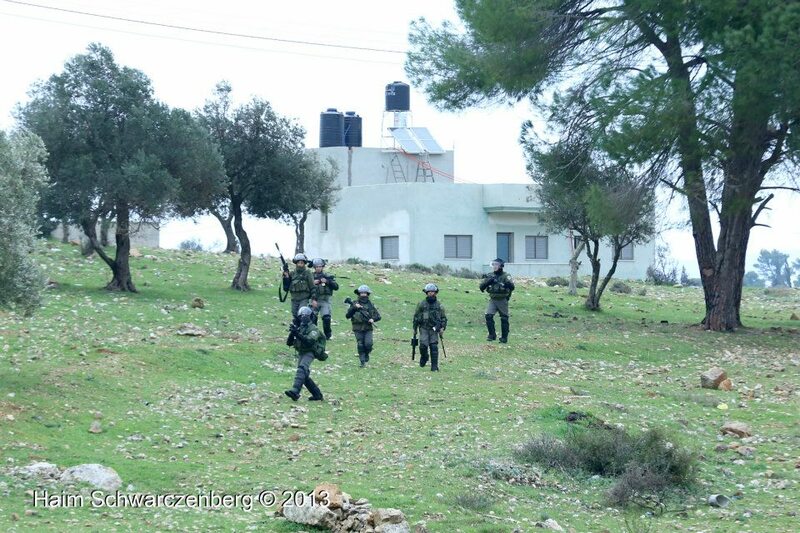 During the raid, the army arrested another Israeli activist from one of the houses. The six detainees were held for more than eight hours, in violation of the law, which only permits holding detainees for a maximum of three hours (or six hours in extreme cases), before they are arrested. At 9pm, soldiers put detainees on an army vehicle and drove them for an hour though different settlements roads then drove back to Nabi Saleh entrance where they were dropped off and released. At the weekly demonstration in Nabi Saleh two Palestinian women stand their ground in the face of the infamous skunk truck. The skunk truck is a mounted water cannon that sprays a foul smelling liquid at high pressures. Following last week’s success in reaching the confiscated spring, army used considerable means to repress this week’s demonstration. According to the protesters, the army mainly targeted women who were leading the protest. Three were arrested. Several dozens of Nabi Saleh residents joined by supporters from Israel and abroad, joined the weekly protest against settlement expansion and the ongoing occupation this week. 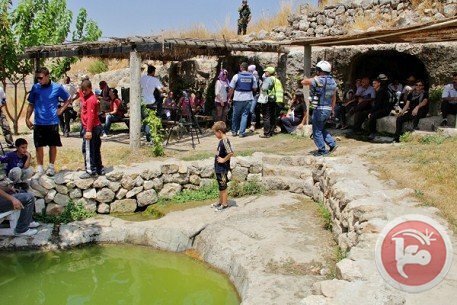 Protesters aimed to repeat last week’s historical victory of reaching the fresh water spring that was confiscated by settlers, with the support of the army, more than two years ago. They marched down the hill overseeing the spring, only to be met with extensive use of tear-gas canisters and rubber coated bullets. After reassembling, protesters tried to make their way through the main road of the village. There, the army resorted to using the “skunk” – a water cannon used to spray foul-smelling liquid on protesters. Targeting in particular two women leaders of the protests, the army sprayed massive torrents of liquid directly at them. Three protesters were arrested by the army amidst the clashes: A Palestinian woman, an international solidarity activist and an Israeli activist. The three all spent the night in detention and should be brought in front of a judge. Under the Israeli apartheid legal system, an Israeli detainee has to be brought in front of a judge within 24 hours whereas a Palestinian can be detained for eight days before judicial review is stipulated. This is true even if both detainees were arrested during the same demonstration and are accused of the same charges. Nabi Saleh is a small village of approximately 550 people, twenty kilometres north west of Ramallah in the West Bank of the Occupied Palestinian Territories. The Israeli colony of Halamish (also known as Neveh Tzuf ) was established on lands belonging to the villages of An Nabi Saleh and Deir Nidham in 1976. In response to the illegal colony being established on their land, the residents of An Nabi Saleh and Deir Nidham began holding demonstrations in opposition to the stealing of their land and the establishment of the colony (whose establishment violates international law). The residents of An Nabi Saleh and Deir Nidham lodged a court case against the colony in Israel’s high court, but were unable to stop the construction the illegal settlement. Dozens of residents of Nabi Saleh, joined by supporters from Israel and abroad, marked a historic victory on Friday when they succeeded in reaching the village’s confiscated spring. Protest in the small hilltop village started in December 2009 as a response to the annexation of the fresh water spring and stealing of more of the village’s land by the adjacent settlement of Halamish. Since then, weekly protests have continuously attempted to reach the spring but always met with harsh military violence. In the past few months, two women’s marches were able to reach the spring on weekdays, but this week marked the first time in which the Friday demonstration arrived to the site. Two settles were bathing in the spring when a group of protesters arrived. The two were guarded by an army battalion, put in place to ensure, so it seems, their peaceful recreation on stolen land. 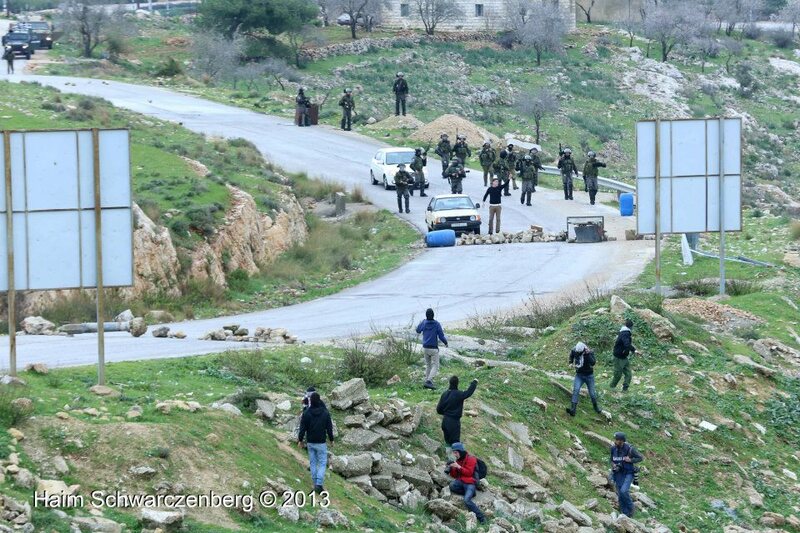 Additional Israeli forces arrived in the area and closed it in order to stop the demonstrators. Protesters placed a Palestinian flag at the site despite the anger of settlers and soldiers, and clashes broke out between the Palestinians and forces stationed in an army tower. 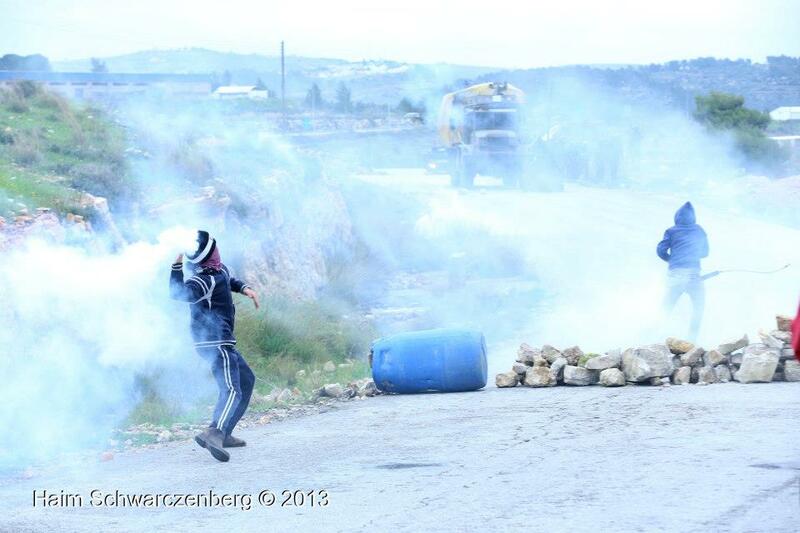 As protesters were making their way back to the village, Israeli forces attaked them with tear gas and stun grenades and the “skunk”. No injuries or arrests were reported. Since its establishment in 1977, Halamish colony has continued to expand and steal more Palestinian land. In 2008, the residents of An Nabi Saleh challenged the building of a fence by the colony on private Palestinian land and which prevented Palestinians from accessing their land. The Israeli courts ruled that the fence was to be dismantled Despite the Israeli court ruling, the colony continued to illegally annex more Palestinian land. In the summer of 2008, the Israeli colonists from Halamish seized control of a number springs, all of which were located on private Palestinian land belonging to residents of An Nabi Saleh. 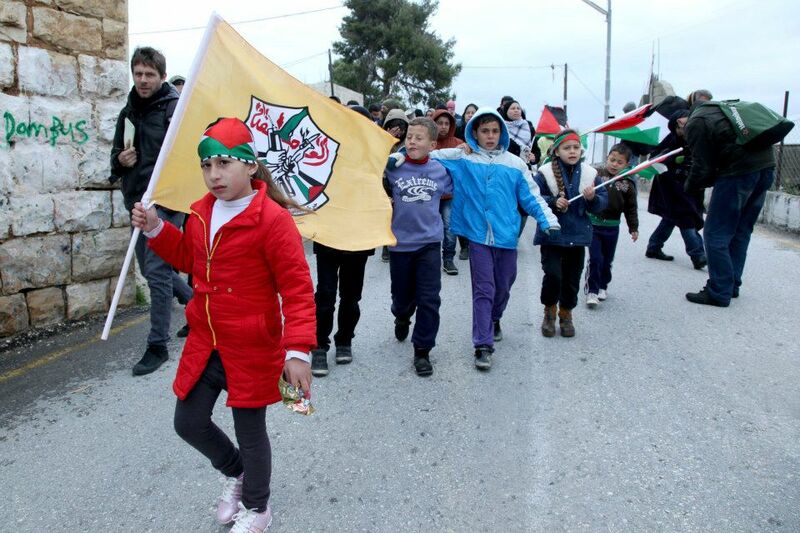 In December 2009, the village began weekly non-violent demonstrations in opposition to the illegal Israeli colony of Halamish annexing of the fresh water springs and stealing of more of the village’s land. Since An Nabi Saleh began its demonstrations, the Israeli military has brutally sought to repress the non-violent protests, arresting more than 13% of the village, including children. In total, as of 31 March 2011, 64 village residents have been arrested. All but three were tried for participating in the non-violent demonstrations. Of those imprisoned, 29 have been minors under the age of 18 years and 4 have been women.